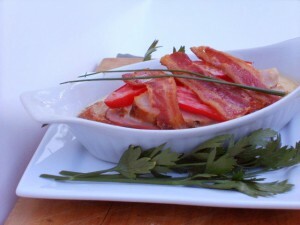 The Food Network’s Bobby Flay has the Kentucky Hot Brown on the menu in his restaurants. This is one important dish with as many variations from Chef Fred Schmidt’s original 1920’s recipe at The Brown Hotel in Louisville, Kentucky, as there are mint juleps at the Derby. Back in the middle nineties, my daughter and I enjoyed a birthday lunch at an antique filled Victorian tea room in Tarpon Springs, Florida. Undoubtedly the best version I have ever encountered. The ham was smoky, the turkey was herb infused and moist, and the elusive sauce balanced the whole shebang. Put under the broiler, it screamed delectable with the addition of garden ripe tomatoes and crispy bacon. The ultimate touch, three pristine asparagus spears! That did it. I was hooked. To reconstruct this at home, I was inspired by Dianna Rattray’s version from Southern Food magazine. I made my own modifications and I am sure everyone has their preferences as to cheeses etc. Try doubling this recipe to make as a casserole for an elegant brunch. Bet on a winner! Melt butter over medium heat; add flour and make a roux. Add milk or half and half, seasonings, and cheeses. Slow heat down to medium low and cook until thick and bubbly while stirring constantly. Cut toast diagonally and place in individual baking dishes or oven proof ceramic plates. Layer ham and turkey slices and smother with hot cheese sauce. Top with tomato slices. Bake at 350f for 20-25 minutes until hot and bubbly. Add crisp bacon slices, asparagus spears and Parmesan cheese. Turn oven to broil. Watch carefully when broiling for the final step. More about mushroom seasoning … it really enhances most every dish except tapioca. http://weirdvegetables.blogspot.com/2010/12/magic-mushroom-seasoning.html. Great blog. Great post. Check it out. Use a lightly oiled 9×13 casserole for this recipe and bake at 350 for 20-25 minutes without bacon, asparagus, and Parmesan. Add these at the end and use broil to finish. Watch carefully. Another variation is to use a layer of avocado slices on top of the turkey and ham before smothering with cheese sauce. That is if you are without asparagus, as I was.